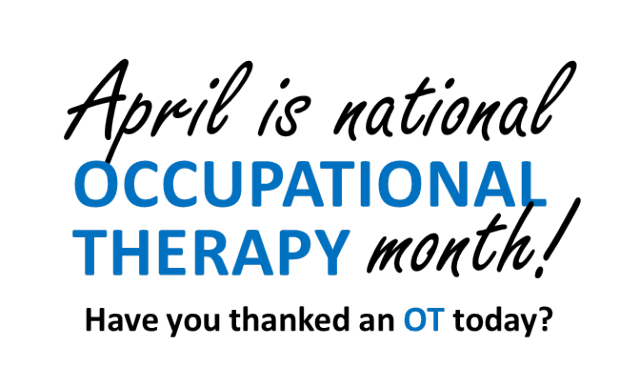 ​April is Occupational Therapy Month! To celebrate, I wanted to share a little more about what OTs do. When I tell people that I’m an occupational therapist (OT), they often think that means that I help people get jobs. That is not the case. Occupational therapists help people with their daily occupations. That means your daily jobs: going to school/work, social participation, rest & sleep, leisure, play, and ADLs. ADL stands for Activities of Daily Living, and are the tasks you do on a daily basis, like getting dressed, eating, and grooming. We also work on more complex tasks, like cooking and transportation. The goal of occupational therapy is to help people do the tasks they want to do to the best of their ability! Pediatric occupational therapy aims to help children to participate in their daily occupations and focuses on helping children to develop the skills they need to grow into functional, independent adults. Pediatric OTs can focus on fine motor skills and motor planning, sensory integration, self-care, cognition & processing, emotional regulation, social skills, and feeding. Pediatric therapists often incorporate play into therapy, as play is considered one of the largest daily occupations for children. 1. You might find occupational therapists in many facilities: hospitals, outpatient clinics, schools, consultants, Early On, skilled nursing facilities, rehabilitation centers, palliative care, and more! 2. Occupational therapists are skilled in working with people throughout the lifespan. 4. Occupational therapy was established as a profession in 1917 and has now existed for over 100 years! 5. Occupational therapists are considered qualified mental health providers in some states. Have you thanked an OT today?